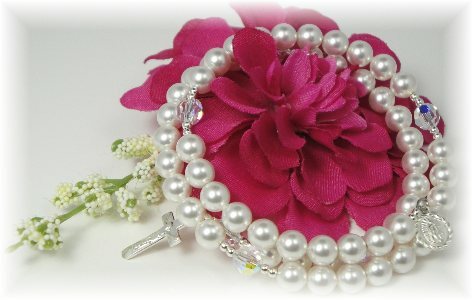 Beautiful Swarovski pearl rosary wrap bracelet in white or pink pearl with crystal and sterling silver accents. This beautiful 5-decade 2-1/4" diameter adjustable rosary wrap bracelet is created with 6mm Swarovski pearls and crystals, petite sterling silver miraculous medal and crucifix cross charm. This meaningful gift will be a cherished keepsake. 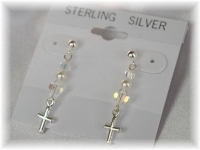 Choice of white pearl with clear crystals as shown, or light pink pearls with rose crystals. One size fits most.